Though I never met her, I wanted to honor the legendary Roxanna Floyd because I felt like I knew her through her work. She was so committed to excellence and so expert in her craft, she gave you her as her subjects gave you face. As I read more about her after the news broke, I learned that she passed in her sleep at home in Clinton Hill, Brooklyn. I’ve probably run into her at Fort Greene Park, or Carol’s Daughter and never even knew it. For her to transition at 49 has to seem unreal to those closest to her–and the beauty world at large. Fortunately, Harriette Cole, another woman whose work I respect deeply, eulogized her in a note recently posted on Facebook. Her words confirm that Roxanna was the protypical Sister Swan: working hard–and making it look easy with grace, integrity and passion. Re-posting with sorrow at Ms. Floyd’s transition and condolences to her family and friends. We just lost a great one, Roxanna Floyd, a very special makeup artist whose precision and love sculpted many a brown-skinned face in the world of entertainment. Our company was fortunate enough to have worked with her for the past year and a half as she served as Creative Beauty Director for Fashion Fair Cosmetics. Just a few weeks ago, Ebony magazine had the privilege of enjoying her expert hand when we photographed our March 2010 cover subject, Gabourey Sidibe, the star of Lee Daniels’ movie Precious. It is with mixed emotion that we celebrate Roxanna’s work so intimately at this moment. A sea of people who knew and loved her have been filling the Internet with memories of working with her, connecting with her, loving her. Roxanna’s very first national magazine cover was for Ebony magazine that she worked on with Ebony fashion and beauty editor Alfred Fornay. I had the unique privilege of working with Roxanna more than 20 years ago when I worked for Essence. I met her through photographer Dwight Carter who booked her for a shoot I produced for the contemporary living department of the magazine. She quickly moved from working with me to making up more than 30 Black celebrities for some 60 Essence covers over the years. 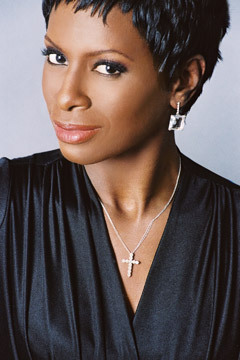 Roxanna Floyd worked with some of our greatest celebrities and models: Angela Bassett, Whitney Houston, Cynthia Bailey (most recently for the Fashion Fair Cosmetics campaign), Queen Latifah, Iyanla Van Zant, Halle Berry, Phina, Foxy Brown, L.L.Cool J. Sinbad, and Danny Glover, plus many, many more. She was a genius with a set of makeup brushes. And she appreciated brown skin so much that she learned how to blend colors perfectly to ensure that a woman of any and every skin tone would be flawless before the camera. Roxanna was a perfectionist. Anyone who knew her will tell you that she was the queen of the eyebrow. She spent as much time as it took to sculpt a brow, so much so that you felt like even if you didn’t have anything but foundation and a brow, you were ready for anything! As I worked with her over many years and countless projects, including multiple books, and several recent Ebony magazine covers, she would always be on set with a magnifying glass, eyeing her subject from a distance to ensure that every detail would translate appropriately for the image being captured. And trust, when something wasn’t perfectly right, she would quietly but clearly pause the shoot to make a much-needed tweak before it could resume. Roxanna took her craft seriously. More, she quietly and fiercely took her clients and her friends seriously. She was a true confidante. Celebrities loved her so, because she would beat a face but not tell! You know how makeup artists and hairdressers often get all the dirt on a person’s life? Well, if Roxie got it, she kept it to herself. A devout Christian, Roxanna Floyd honored the people in her midst. She felt it was her duty to uplift the people with whom she worked, to seek out their best qualities and nurture them. She did not talk about people. Rare for a person in her field. Roxanna loved fully and consistently. I feel so fortunate that I knew her for most of my professional life. She was an ace in the hole for any creative project. But more, she was my friend. It was she who did my makeup at my wedding 16 years ago, trekking an hour and a half outside of Manhattan to ensure that I would be perfect on my big day. And it was she who has checked in with me again and again over the years to make sure I was fine—even when she was suffering her own private hardships. She was a class act. She was a generous soul. The many people who knew and loved her are singing her stories right now through pained tears. We all have memories that make our hearts ache today but that likely will soothe us tomorrow. Roxanna Floyd is survived by her husband, Rick E. Ramos, her mother, Alberta “Bertha” Floyd, and a world full of beloved friends. Harriette Cole is the editor in chief of Ebony magazine. Roxanna Floyd was the makeup artist for her books Jumping the Broom, How to Be, and Choosing Truth. This entry was posted on February 4, 2010 at 10:55 pm and is filed under Entertainment. You can follow any responses to this entry through the RSS 2.0 feed. You can leave a response, or trackback from your own site. mobile games have gone from a remote system, such as mobile and have some amount of Angry Birds. briefly discuss how using Words with Friends or Scrabble for Desktop computer. These extreme exciting games on criminal case cheats these platforms. I read this paragraph completely concerning the comparison of most recent and previous technologies, it’s amazing article. Actually there are deer hunter 2014 hack thousands of option to play games on their mobile phones. book alone and mastered its principles, they’d be the best in their chosen field. If some one desires expert view regarding running a blog after that i propose him/her to pay a quick visit this webpage, Keep up the good work. Unquestionably believe that that you stated. Your favourite reason seemed to be at the internet the simplest factor to keep in mind of.